The ETCS Limited Supervision mode has been recently defined as a fully standardized ETCS operation mode, to be interfaced with a national signalling system. It provides a flexible and scalable version of ETCS. It will be commissioned in Switzerland by Siemens within 2018, substituting the EuroZUB/EuroSignum National Signalling system. After the release of the ETCS Baseline 3.0.0 system requirement specifications by the European Railway Agency, the new ETCS Limited Supervision has been defined as a fully standardized ETCS operation mode, like any other of the modes (e.g. Full Supervision, Shunting, On Sight Mode). Formally this is possible for all ETCS levels but it is most commonly used with Level 1. More specifically, with this solution the ETCS equipment is only used to control the safety restrictions, while the communication of a Movement Authority is left to other systems. Studies have shown that ETCS L1LS has the same capacity as plain Level 1, for half the cost. 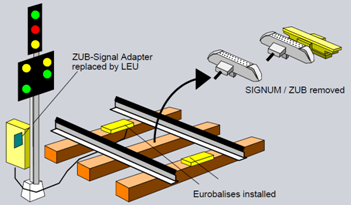 ETCS limited Supervision mode was proposed by RFF/SNCF (France) based on a proposal by SBB (Switzerland Railways) and will be commissioned in Swiss by 2018, substituting the EuroZUB/EuroSignum National Signalling system. The introduction of limited supervision was estimated to give a benefit of €150 million in the Swiss case only. railwaysignalling.eu seeks signalling copywriters and contributors. Send us your application! Rail: How Is It Made?